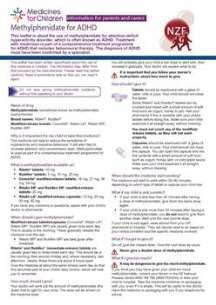 The following leaflet for parents and carers is about the use of methylphenidate (brand names: Ritalin, Rubifen) for attention deficit hyperactivity disorder (ADHD). Treatment with medicines is part of a comprehensive treatment programme for ADHD that includes behavioural therapy. The diagnosis of ADHD must have been confirmed by a specialist. Please note, leaflets at the New Formulary for Children website are only available to users in New Zealand and its territories. Click on the image below to read the leaflet (PDF, 435KB) at the website of the New Zealand Formulary for Children. The leaflet above is an adaption of 'Medicines for children: Information for parents and carers', from www.medicinesforchildren.org.uk. The adaptation is by the New Zealand Formulary for Children.